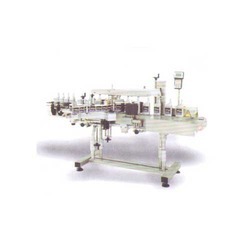 We are a leading Manufacturer of front back vertical sticker labeling machine from Ahmedabad, India. Backed by immense industry experience, we are engaged in manufacturing, exporting and supplying high quality Front Back Vertical Sticker Labeling Machine. In line with set industry standards, we manufacture this machine using the finest quality components and advanced technology under the fruitful supervision of our adept professionals. This machine is used to apply the self-adhesive labels to the containers. Moreover, we also offer this product in various shapes and sizes to cater the various demands of our valuable clients. Pusher conveyor will convey the bottles for labelling. AC frequency variable drive for variable speed with constant torque. Specially designed drive stepper motor mechanism for sticker releasing. Inbuilt dispensing unit for dispense label. To wrap by spunch brush mechanism to wrap the label on product. Micro Controller/ PLC controlled bottle scan sensor and label scanner the gap between two labels. Inbuilt Reel Mechanism to hang the roll. Break assembly to avoid variation during releasing of roll. Anti vibration pad will be provided to avoid vibration during operation. Looking for LABELING MACHINE ?